Now this is great news because with just these chords the sky is the limit! However have no fear! We can still use C, F, G, Am by using what’s called a capo. Basically a capo, as you can see pictures here, is a tool you can use to change the pitch of your open strings. This is just a fancy way of saying you can use the capo on a given fret to be able to play the song using the same chords we are talking about in exactly the same finger positions. Not to worry this would only apply to some songs and we will be sure to tell you for each song. A little note before we hit the ground running. I will let you know when and where to use a capo if you want to play in the original key of the song. However you can feel free to play any of these songs without a capo. But keep in mind that if you plan to play along with the original then using a capo will be required in some cases. I’ll be sure to let you know when that is the case. But again, feel free to play without capo if you want. The only difference is you will continue playing the same chord progressions but will sound slightly different. To play C major, place you ring finger on the third fret on the first string. The ring finger is best in this case because it makes it easier to switch to F, G, and Am. To play G major, place Your middle finger on the second fret of the first string. The use your index finger on the second fret of the third string. Finally, place your ring finger on the third fret of the second string. A minor is probably the easiest chord because it takes only one finger although there is a better grip on F major. To play Am just place your middle finger on the second fret of the fourth string. 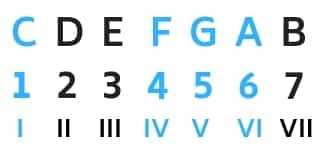 For F major, place your middle finger just like you did with A minor, on the second fret of the fourth string, and add your index finger to the first fret of the third string. That’s it for the chords. You’re all set and ready to go learning these easy ukulele songs. This classic rock song by the Beatles is sang by their drummer, Ringo Star. He was so good on drums and packed some good vocal chords too. Fun fact: Ringo got the song idea during a boating trip with his family in Sardinia after he learned about octopuses and the gardens they build from the captain. The order of the chords is C, Am, F, G. Here’s what the chord chart looks like for the first verse lines at the beginning of the song. This repeats throughout the whole song. Strumming Pattern suggestion: down up, down up, down up, down up. In the bold down up, you can add more emphasis, and use less force on your strumming in the second and fourth down ups (the ones not bolded). This song together with the others on the list makes for an easy catchy tune to play. I especially like the bridge and the chorus. The reggae vibe will definitely rub off on you, let it lead your strumming! Optional: No capo for Leonard Cohen version – capo on 1st fret for Jeff Buckley version. There’s almost no way to leave out this song from the list. It’s highly popular but it is in fact easy, and very memorable too! Don’t forget to play it a few times and getting the hang of it before playing with others or for others. This one came as a shocker when Grace performed this song as her audition on America’s Got Talent. You’ll enjoy her sweet voice, and play along just fine sine it has the same chords we’ve been working with so far. Keep practicing and enjoy using the same patterns. Optional: Capo on 4th fret for original. Capo: it’s best to play without capo. The original key starts with B major which technically already has the second fret capo’d. Capo: 5th fret for original, but a little uncomfortable to play especially on a soprano ukulele. So it might be best to do without a capo for this one. Capo: none needed for original. The original title of this song is “Over The Rainbow”, a ballad sung by Judy Garland for the movie Wizard of Oz. Then Israel Kamakawiwoʻole recorded a medley version together with What a Wonderful World. He recorded the song by him singing and accompanying with his ukulele. This song version has been used in many movies and soundtracks. Start playing using a simple all down strumming pattern for this song. Once you get comfortable at your strumming technique you can try ‘down, down up, up, down up’ swinging the pattern to get the correct feel of the song. Listen to what the strumming pattern sounds like here first in the songs original tempo then in a slower tempo for you to practice. Before you try playing along, get familiar with the chord progression as you see in the chord chart below. These same chord changes repeat throughout the whole song so this is a good pattern to practice. After you’ve gone over these changes a couple of times and you feel comfortable, play the play along track and you can practice playing the song together with us! After playing along with some of these songs, I think you would agree with me that it is so fun to play songs that have the C, G, Am, and F chords. These are among the most common chords you can play, so why not use these same chords and be able to play hundreds and even thousands of songs!? I hope you enjoyed this article – don’t forget to share this post on facebook, twitter, or even emailing the link to this article to your friends.